Restaurant style glazed bbq spare ribs marinade cooked right from your oven, no fuss, in minutes. 1. Have butcher trim and remove fat from ribs. Trim Ribs into 4 inch sections. (Ribs can be cleaned, trimmed and cut at home with safety). Blend Char-Xiu (pronounced Char Sue) sauce and Jake's Original Barbecue Sauce in a bowl. Baste sauce mixture over ribs, cover and refrigerate for about 2 hours. 2. 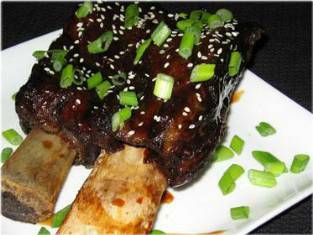 Wrap Short Ribs in aluminium foil and grill at 180 degree for 30 minutes. 3. Unwrap and continue to grill until ribs are done. Check cooking chart below for appropriate cooking temperature. Need the BBQ Sauce for this recipe? No problem, buy Jake's BBQ Sauce and receive First Time Buyer Discounts as well. Use code: 1707200910 with any item and receive a 10% discount. Just enter the discount code at checkout and receive your first time buyer discount.